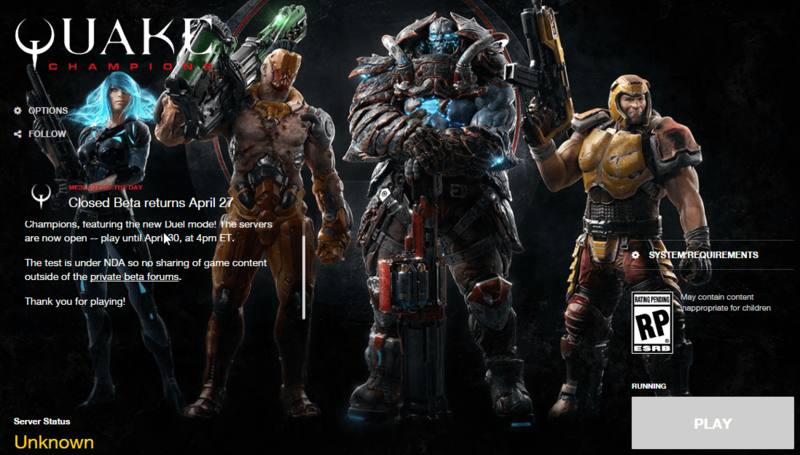 Kentuckynerd.com Quake Champions Beta Invited! - Closed Beta April 27th! Got invited to the closed beta. Too bad, it has an NDA (Non-Disclosure agreement.) and I cannot show screenshots or really information at all. I will say that it is really fun. It took some things from other certain games like loot crates which are cool to unlock skins or whatever. I’ve played a few matches of team death match. Feels just like the ole Quake III. It’s not perfect though, it’s kind of laggy. Not sure what up with that. I don’t think there are dedicated servers yet or something in my opinion. They had best be on their way because that’s the only way to truly play Quake is with Dedicated Servers. The music isn’t that great either. That is it guys, bout all I can really say anyways sorry for no screens they would get flagged and took down immediately or I would lose my beta at the very least. Bethesda I hope the Quake Champions Beta goes the way you want it too! It’s great so far!